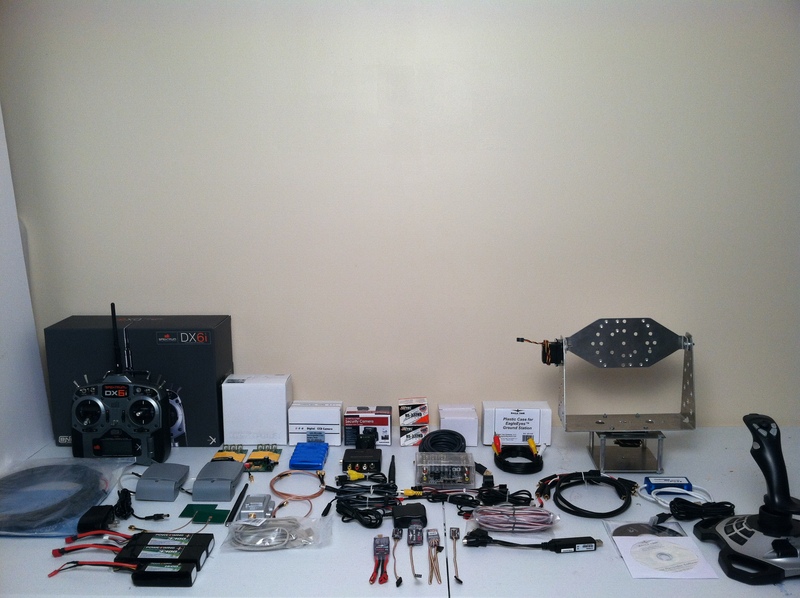 I am selling some FPV equipment and wondered if you are interested in purchasing it or if you know of someone who might be interested. I have a brand new Eagle Tree System. I purchased the equipment not realizing that in the future I would prefer using a video signal using spread technology. I have the ground station for tracking and some stabilization sensors and some other great features that can be tied together. Note that there are three packages for sale, the pictures are below. There are two receiver boards and two patch antennas. They plug directly into the Eagle Tree ground station via RCA cables. If one signal goes down, it can re-connect instantly to the other receiver. The cable setup for the airplane is made to plug directly into everything aboard your aircraft. The Eagle Tree system powers everything by one battery. This is ideal because you can plug everything up including the engine. This is an extremely neat feature. No matter what is connected to the system, it runs off of one battery. This makes the setup simpler because you can continue to add. I had some custom cables made to have the video signal go through the eagle tree system so I could view it on my monitor. This is possible because the video feed is imbedded in the data sent to the Eagle Tree. You can sit at your monitor and view all your data from there. You do not even need to use your laptop. A friend gave me the idea for the setup. We used his equipment, tested out the aircraft and everything worked great. Flying at a nearby field, I began getting some ground planing. I realize that there was a loose connection in the RG-316 cable. The signal dropped and thought that I had lost the whole aircraft. Luckily the other receiver picked up (just saved $2,000). I also have a video system; it has a 4.5-mile range. Basically the setup is one transmitter with 7dbi antenna and is 500Mw at 5.8GHz. Now you might be asking yourself, why would I want a 5.8GHz setup? Well, the video signal is fantastic and much higher. It does not interfere with other signals such as a 2.4GHz which many things run on. It uses two receiver boards and RG-316 cable extensions for the patch antennas to be placed on the pan/tilt station with servos. The pan/tilt servos are plugged directly into the eagle tree system for tracking. The camera is a clover camera, very compact and durable. The cable will power both the camera itself and the transmitter and covers the video transmission to the transmitter. This is a great setup and at a good price. If you want more information on this setup please let me know. I have some great pictures. Please understand, this is some very rough information and does not cover everything. Thank you for being interested in the equipment I have been selling. At the bottom I have enclosed three different sets of information about what I am selling. These are extremely good sets of equipment. You will NOT find anything better on the market. I searched day and night for this setup and the only reason I am not using it is because I am going to a digital setup. If you purchase more than one system you will get a discount. Send me a message telling me which set you want to purchase and I will send you a finalized quote. Feather-light and about the size of a postage stamp, the inertial sensor based Guardian stabilization expander provides world class stabilization to your fixed wing or elevon model airplane when coupled with our OSD Pro. It’s a “Guardian Eagle” for your model! To stabilize your model, just mount the Guardian in a level orientation, plug it into your OSD Pro, do some minimal setup, and away you go. Stabilization gain can be controlled via an extra knob on your radio (via the OSD Pro’s Aux2 port), so you can tune or turn off stabilization as you fly! The Guardian also provides an Artificial Horizon Indicator (AHI) on your OSD Pro screen, and supports both standard and elevon fixed wing models. The OSD Pro is the ultimate on-screen display for your FPV (First Person View) equipped recreational model airplane, heli, car or boat! The OSD Pro displays all the key information about your model’s status, and has many advanced features such as voice alerts high resolution raster graphics, a new “RADAR” synthetic map, “Return to Home,” Artifical Horizon display, Acoustic Variometer, and waypoints within visual range. Use PC software and on-screen menus are provided for adjusting the EagleEyesTM to work flawlessly with the tracker of your choice. An exclusive to Eagle Tree, multiple pan points can be calibrated, resulting in greater panning accuracy even if your pan servos are somewhat nonlinear. The built-in regulator drives even large pan/tilt servos, with no need for an external BEC. Telemetry- When coupled with our OSD Pro Eagle Tree data (not just GPS position) are transmitted to your laptop, via your video transmitter and the EagleEyesTM USB port (separate USB cable required). Your model's flight can then be graphed and displayed with our powerful software, or visualized (either in real time or after your flight) with Google Earth! With the EagleEyesTM, telemetry is embedded invisibly in the video, rather than in the audio channel. We chose video telemtry because it is much more reliable and faster than audio telemetry, and audio telemetry takes up your audio channel, so you can't hear motor sounds, OSD Pro voice prompts. Four channel A/V Distribution. Ever wish you had more video/audio outputs? The EagleEyesTM has four built-in outputs! 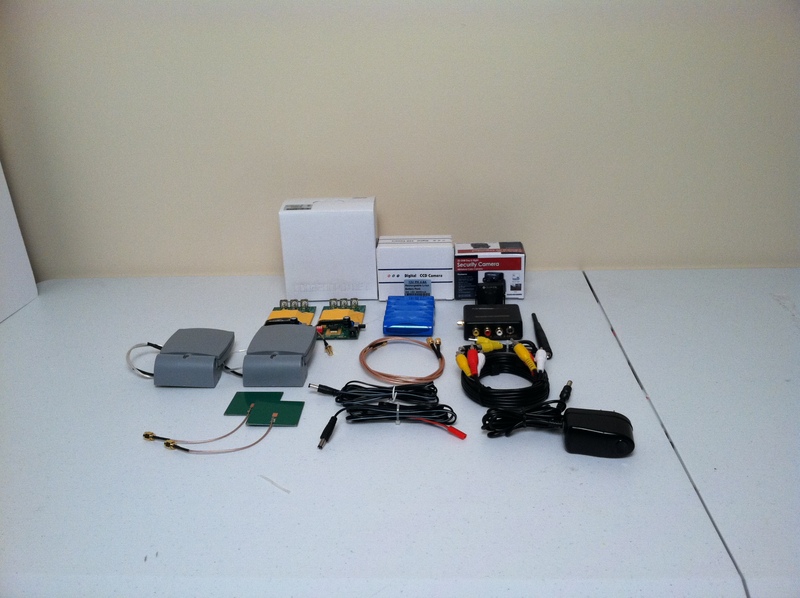 Programmable Low Voltage Alarm. How is your ground station battery doing? Now you can program a low voltage alarm buzzer, which alerts you when your battery is below your chosen voltage. The buzzer can also be programmed to alert for other conditions, such as poor telemetry signal. Four video outputs (75 ohm) and four "line level" audio outputs. Power Input- Power input range approximately 6V to 14V. Barrel style power input with standard 2mm center pin. 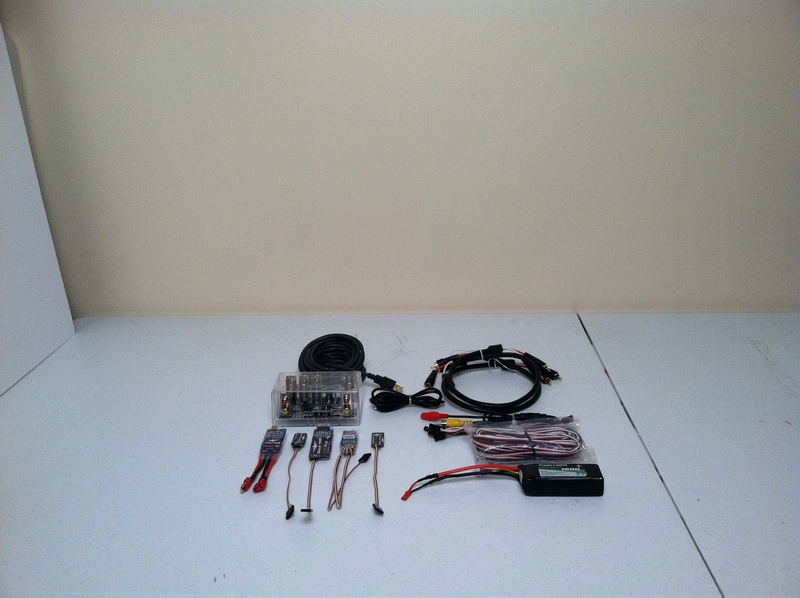 Two units Servo Outputs for pan and tilt trackers. Unit is capabable of delivering 5A burst output to drive even large pan/tilt servos. Usb port for connecting to PC for live PC display of telemetry and firmware update. The case can be used with or without the top portion. 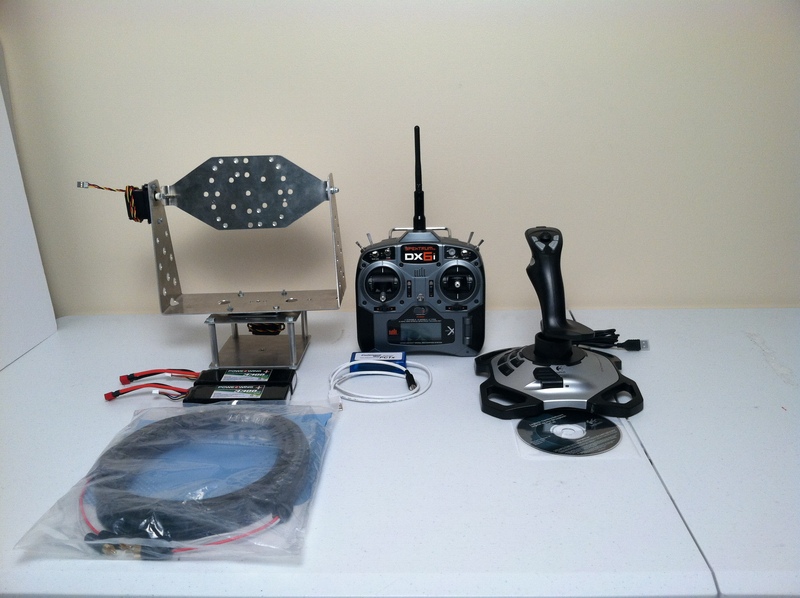 The bottom portion includes "screw bosses" for rigidly mounting the EagleEyes to your ground station or tracker, and the top portion includes an internal snap mount for the PowerPanel LCD. 1 Super High Resolution Mini Color Day/Night Camera with adjustable mounting bracket. Use any portable TV screen for video viewing or optional RCA to USB adapter for use with any laptop. High Quality Real-Time Wireless Video up to 3mile Clear-Line-of-Sight Range Great for all types of Airborne RC & UAV applications, airplanes, Helicopters, Blimps and more. SMA connections for TX & RX for use of Omni-Directional or Directional Antennas. I will be glad to give you technical support if needed. This is a fantastic setup you will NOT find anywhere else. Most companies sell inexpensive equipment that either does not perform well or does not work well with the aircraft you are using. I have tested this exact type of system on many other aircraft and in different applications. For example this system is only supposed to function in a range of 3 miles line of sight.